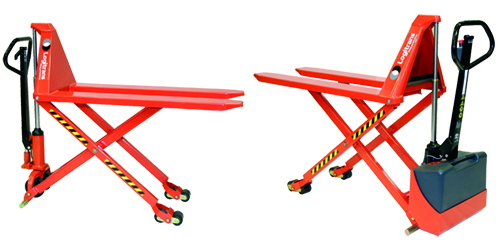 Transport pallet loads and lift them to an ergonomic work height to make transferring products to a work station or conveyor less of a strain on workers to help reduce the risk of lifting related injuries. HL1006-2147 Manual 21.25" 47" 31.5" 3,300 lbs. to 18.5"/2,200 lbs. to 31.5"
HL1006-2160 Manual 21.25" 60" 31.5" 3,300 lbs. to 18.5"/2,200 lbs. to 31.5"
HL1006-2170 Manual 21.25" 79" 31.5" 3,300 lbs. to 18.5"/2,200 lbs. to 31.5"
HL1006-2747 Manual 27" 47" 31.5" 3,300 lbs. to 18.5"/2,200 lbs. to 31.5"
HL1006-2760 Manual 27" 60" 31.5" 3,300 lbs. to 18.5"/2,200 lbs. to 31.5"
HL1006-2779 Manual 27" 79" 31.5" 3,300 lbs. to 18.5"/2,200 lbs. to 31.5"
EHL1004-2147 Electric 21.25" 47" 31.5" 3,300 lbs. to 18.5"/2,200 lbs. to 31.5"
EHL1004-2160 Electric 21.25" 60" 31.5" 3,300 lbs. to 18.5"/2,200 lbs. to 31.5"
EHL1004-2170 Electric 21.25" 79" 31.5" 3,300 lbs. to 18.5"/2,200 lbs. to 31.5"
EHL1004-2747 Electric 27" 47" 31.5" 3,300 lbs. to 18.5"/2,200 lbs. to 31.5"
EHL1004-2760 Electric 27" 60" 31.5" 3,300 lbs. to 18.5"/2,200 lbs. to 31.5"
EHL1004-2779 Electric 27" 79" 31.5" 3,300 lbs. to 18.5"/2,200 lbs. to 31.5"